Opening the proceedings was the Councillor for Cultural Heritage, Paola Marcheggiani, representing Mayor Alessandrini, who praised the active role taken on by the Fondazione Aria as well as the other organisers of the event in finally building a bridge between Art and Business in line with national and European market trends. Cecilia Casorati, the new artistic director of the Fondazione Aria, introduced the theme of the meeting, ‘Common Aims’, and briefly illustrated the foundation’s future project aimed at creating a truly operative synergy between artists, businessmen, the public and the territory within an international dimension. The President of the Fondazione Aria, Elena Petruzzi, then highlighted the shared philosophy of the D/A/C project in absolute coherence with the common aim of shifting the point of view from the singular to a collective dimension, promoting a previously unseen model of cultural development of the territory. Mario Pieroni, President of RAM radioartemobile, creator and promoter of the D/A/C meetings in the major European cities, went on to illustrate the idea at the root of these meetings, declaring that dialogue between producers and artists means demonstrating an opening towards together finding solutions not only to the practical problems of reality but of all aspects of life. He then handed over to Getulio Alviani who, with a critical yet very constructive intervention, reminded that an artists’s commitment has always been and continues to be that of creating the present with an eye to the future. The Friulian businessman Maurizio Felluga affirmed art’s ability to be an added value for a business, explaining how the ‘Vigne Museum’, realised by Yona Friedman and Jean-Baptiste Decavèle on the occasion of the hundredth birthday of his father Livio Felluga, has become in a very short amount of time a true tourist attraction, becoming as such an asset to his business, to those who have worked on its creation, but above all to the territory. Of this work – a great open structure which will in time be covered by a hundred new grapevines, becoming perfectly integrated with the land – spoke the artist Jean-Baptiste Decavèle, highlighting how producers and artists complement each other. Enrico Marramiero, A.U. ALMA C.I.S. and President of the wine company Marramiero, underlined the active role of the Fondazione Aria which cannot do without the involvement of youngsters in its cultural projects in transferring to them the need to work for the search of an ideal; he then explained how creativity nowadays is a strategic resource for finding innovative solutions at all levels of a company. The President of Valagro S.p.A. Ottorino La Rocca affirmed that ‘Aria too began by around a hundred businessmen, artists, professionals and people active in enriching the territory through culture coming together around an idea. Aria will continue its progress creating new synergies with those who would like to share the ideals of the growth of the territory, leaving negativity behind and looking ahead with optimism towards the goals of future growth’. The Milanese artist Liliana Moro, who for the occasion constrcucted the table ‘Quattro stagioni’ (‘Four Seasons’) around which the meeting was held, told of her own experiences of ‘Public Art’. The artist spoke of the project on which she is currently working, commissioned by the Fondazione Zegna, underlining the importance of the relationship between work and territory. Lucia Zappacosta, in closing, retraced the story of the Alviani ArtSpace, of which she is the director, which in only two years has become a reference point for youth creativity not only in Abruzzo. 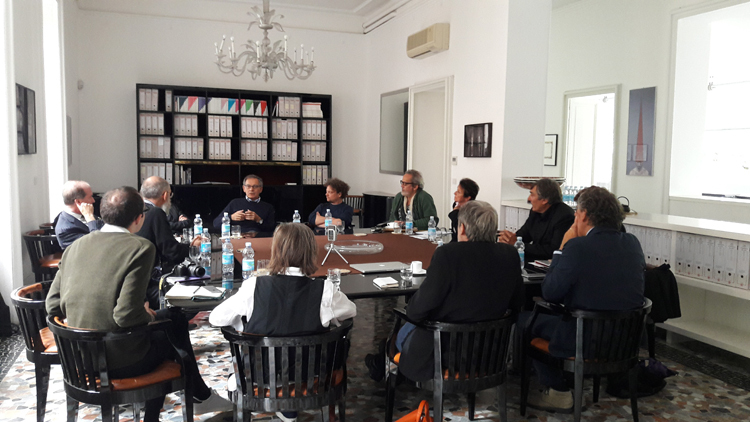 The meeting held in Pescara is the 14th D/A/C, an acronym for Denominazione Artistica Condivisa (Shared Artistic Denomination). The information centre in the foyer was a piece by Alessandro Cannistrà entitled Oggetto di pensiero (Object of Thought) (2014). 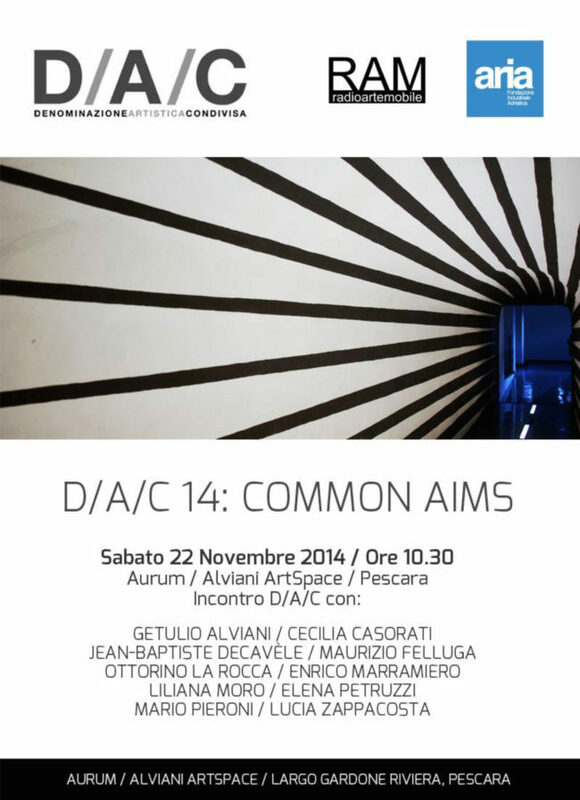 Friday September 30th 2016 the Antonio Ratti Foundation invites to the round table of D/A/C 17, moderated by Lorenzo Benedetti and introduced by Mario Pieroni and Dora Stiefelmeier. artists Stefano Arienti, Jean-Baptiste Decavèle, Liliana Moro, Diego Perrone and Annie Ratti; enterprises and business sectors Giacomo Castiglioni, President and AD of Castigioni S.p.A., Paolo De Santis, AD of Meta Como and art collector, Aram Manoukian, President and AD of Lechler S.p.A., Maurizio Riva, President of Riva 1920 SpA, Rosanna Viganò, partner of Seterie Argenti S.p.A and art collector, Giovanna Felluga of AtemporaryStudio and artistic coordinator of the Vigne Museum_Livio Felluga by Yona Friedman & Jean-Baptiste Decavèle.